Listed by The Sunday Times as 12th fastest growing company in the UK, parent company Inkjet Direct Ltd contracted Impact to build an oSCommerce based ecommerce website for Phoenix Direct. With over 6,000 products it was heavily customised, and integrates with their backoffice system in both directions so that latest stock gets automatically imported every night and orders are pushed via XML into their fulfillment system. 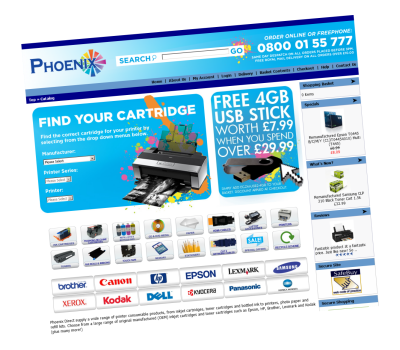 To allow users to find products quicker and easier we developed an ajax ink locater. Plus to assist the marketing department we built additional modules such as: a promotional bundle builder, discount voucher builder, search data capture mechanisms, customised reporting and full google tracking. It is fully integrated to NetBanx secure payment gateway and offers 3D secure payment technology to allow users peace of mind when purchasing. "Impact Technology worked very closely with us throughout the planning process of a new retail website, offering expert advice and opening our eyes to new technology and various digital marketing options. Andy and Jo kept in regular contact throughout the development stage by providing updates, recommendations and generally being a cut above other web developers that we have worked with in the past."